Radiation damage represents a fundamental limit in the determination of protein structures via macromolecular crystallography (MX) at third-generation synchrotron sources. Over the past decade, improvements in both source and detector technology have led to MX experiments being performed with smaller and smaller crystals (on the order of a few microns), often using microfocus beams. Under these conditions, photoelectrons (PEs), the primary agents of radiation-damage in MX, may escape the diffraction volume prior to depositing all of their energy. The impact of PE escape is more significant at higher beam energies (>20 keV) as the electron inelastic mean free path (IMFP) is longer, allowing the electrons to deposit their energy over a larger area, extending further from their point of origin. Software such as RADDOSE-3D has been used extensively to predict the dose (energy absorbed per unit mass) that a crystal will absorb under a given set of experimental parameters and is an important component in planning a successful MX experiment. At the time this study was undertaken, dose predictions made using RADDOSE-3D were spatially-resolved, but did not yet account for the propagation of PEs through the diffraction volume. Hence, in the case of microfocus crystallography, it is anticipated that deviations may occur between the predicted and actual dose absorbed due to the influence of PEs. 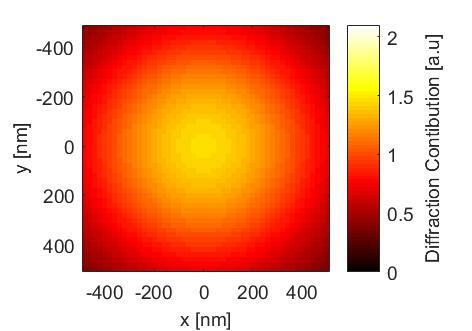 To explore this effect, we conducted a series of simulations of the dose absorbed by micron-sized crystals during microfocus MX experiments. Our simulations spanned beam and crystal sizes ranging from 1μm to 5μm for beam energies between 9 keV and 30 keV. Our simulations were spatially and temporarily resolved and accounted for the escape of PEs from the diffraction volume. The spatially-resolved dose maps produced by these simulations were used to predict the rate of intensity loss in a Bragg spot, a key metric for tracking global radiation damage. Our results were compared to predictions obtained using a recent version of RADDOSE-3D that did not account for PE escape; the predicted crystal lifetimes are shown to differ significantly for the smallest crystals and for high-energy beams, when PE escape is included in the simulations.